THE 2017 Melbourne Cup will be remembered as the day 24-year-old trainer Joseph O’Brien overshadowed his legendary father Aidan O’Brien to create a famous chapter in the race that stops the nation. Joseph O’Brien’s Rekindling edged past his father’s Johannes Vermeer with 100m to run to win by a short head in a dramatic finish. Johannes Vermeer held on for second ahead of Max Dynamite (third) and Big Duke (fourth). Rekindling trainer Joseph O’Brien is now enjoying his first Melbourne Cup triumph after the 24-year-old trumped his dad, champion Irish trainer Aidan O’Brien, in a dramatic family showdown. Aidan O’Brien’s Johannes Vermeer led the field with 150m to run, but was edged out by a short head when his son’s Rekindling made a frantic run to the post. Fittingly, Rekindling was the youngest horse in the race. Rekindling owner Lloyd Williams also told Channel 7 he warned Aidan O’Brien to watch his back — because his son was breathing down his neck. On Tuesday, the son went ahead of his legendary father. “I’m proud of this young man (Joseph),” Williams said. He said during the official presentation of the Melbourne Cup, that history will soon recognise Joseph O’Brien as one of the leading trainers in the world. The O’Brien quinella was a dream result for the Irish family — but only because the apprentice toppled the master. Rekindling’s run pulled off a $4.5 million swoop by the Williams connections with the $3.6 million first-prize and the $900,000 second-prize both heading to the iconic racing family and its connections. Brown positioned Rekindling perfectly two off the rails at the turn and enjoyed a clear run to the post. The four-year-old stallion was able to pull alongside Johannes Vermeer down the straight and edged in front with 100m to run. The Racing community had nothing but respect for his perfect ride. The man himself was nothing but class. “I can’t believe it. I chased the ride about six weeks ago and with a light weight (thinking I was) a big chance to get on him,” Brown said. Cismontane set the early pace, while Melbourne Cup rookie hoop Ben Allen sat last on Thomas Hobson at the 1600m mark. It quickly became clear at the turn that the run to the line would be between Johannes Vermeer and Rekindling after the two Lloyd Williams runners took off from the field with 400m to run. Rekindling enjoyed a dream run with hoop Corey Brown producing a stunning ride on the four-year-old stallion. Williams achieved a quinella in the race that stops the nation with Johannes Vermeer finishing second ahead of Max Dynamite. 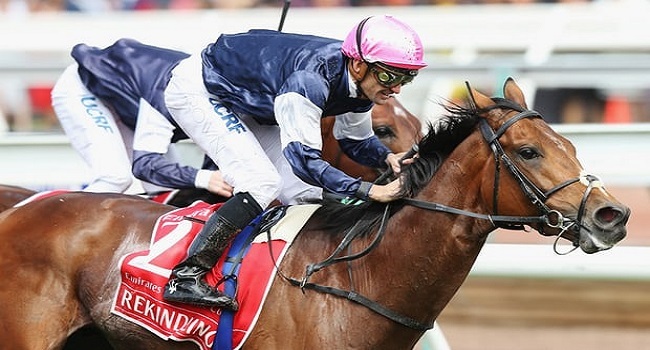 It was Williams sixth Melbourne Cup victory. “Absolutely a dream,” Williams said.